GTM Research’s solar analysts release every quarter, the most important data and findings from the past three months. The most important charts from the Q4 2014 Solar Executive Briefing follow. 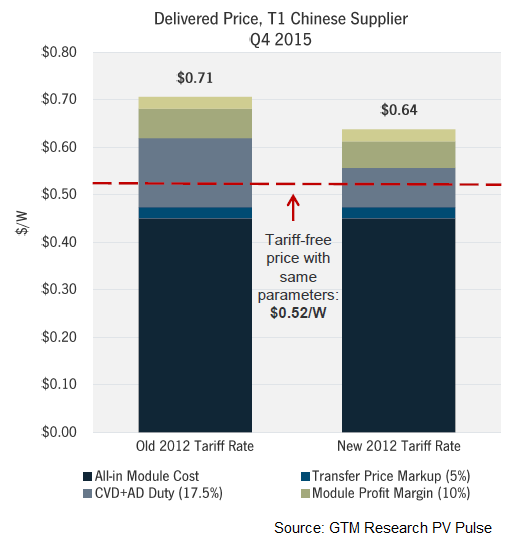 The new China solar tariff decision may drive panel prices below 65 cents per watt this year. High-efficiency module technologies are gaining steam. The megawatt-scale solar operations and maintenance (O&M) market still looks like the Wild West. Dozens of companies are fighting for market share in the operations and maintenance market, from inverter and module manufacturers to developers and EPCs. Everyone wants a piece of the O&M pie. Grid integration is becoming an increasing focus for inverter manufacturers. Net energy metering is becoming popular outside of the U.S.
Net energy metering has helped grow distributed generation PV markets in the United States, and other countries have started to take notice. GTM Research’s Adam James highlights a few NEM proposals across three continents that aren’t North America. More than 4 gigawatts of utility-scale solar have been procured outside of RPS requirements in the past twelve months. GTM Research’s Cory Honeyman attributes the success of projects outside RPS guidelines to utility-scale PV’s competitiveness with natural-gas alternatives. Best-in-class residential solar will be installed for less than $3 per watt this year. Loans are the hottest thing in U.S. residential solar. As we reported last year, the market share for residential solar leases peaked in 2014 as loans have emerged and shifted the market back toward direct ownership. Solar Analyst Nicole Litvak developed a taxonomy of companies offering residential solar loans in the U.S.